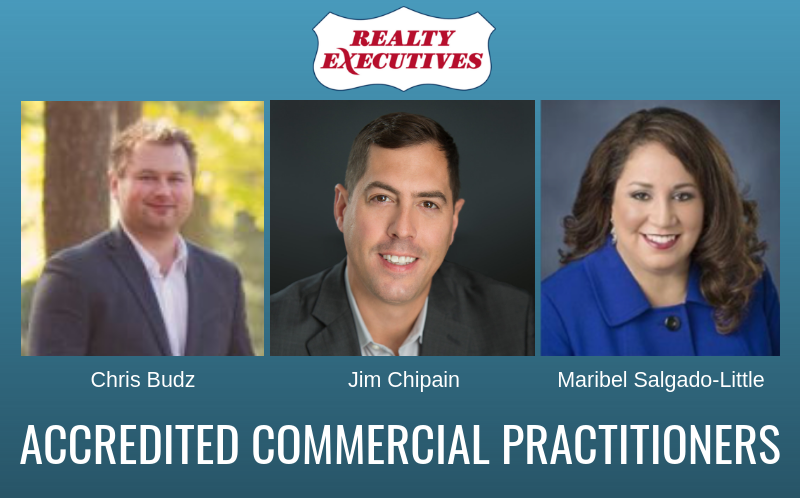 Realty Executives International is excited to announce that three Realtors from the Realty Executives Elite brokeragChris Budz, Jim Chipain and Maribel Salgado-Little – have recently been certified as an Accredited Commercial Practitioner (ACP) by the Mainstreet Organization of REALTORS®. The ACP certification is currently held by less than 100 brokers in the State of Illinois. In order to receive an ACP title, recipients must complete a hands-on, four-day program that goes beyond the surface and provides in-depth training to build confidence and skills necessary to succeed in commercial real estate. Upon completion of the course, the REALTOR® has foundational understanding of commercial forms and terminology, negotiation strategies, generating leads, referrals and building an online presence through the use of social media. Jim Chipain, licensed broker and REALTOR® with Realty Executives Elite, was introduced to the business world by laboring in his family’s grocery store business. There he learned valuable lessons that he still applies to his real estate career today: a strong work ethic, tenacity, drive and an entrepreneurial spirit. Jim attended Loyola University of Chicago where he received his bachelor of business degree, majoring in both marketing and management. Post-graduation, Jim’s professional business career has spanned over 19 years. His previous position as corporate president of a regional midsize company furthered his expertise and knowledge of consumer relationships and marketing – fundamentals to his current real estate career. Jim’s commercial real estate career has been driven by a client-first mentality. From tenant representation to investment real estate in the multifamily and retail realms, Jim has been driven by the individual needs and objectives of each of his clients. Maribel Salgado-Little is a licensed, full-time REALTOR® Broker with Realty Executives Elite. She has over 25 years of professional corporate business experience and is also bilingual in Spanish. Through her affiliate partnerships she can sell real estate not just locally, but also through her international footprint. Maribel is a graduate from Roosevelt University where she received her Masters of Business Administration with an emphasis in Integrated Marketing Communications. Prior to that, she received her Advances Master’s Certificate in Project Management from George Washington University and Bachelors in International Business and Spanish Translation from Northern Illinois University. She has a passion for real estate and serves on several real estate committees through the Mainstreet Organization of Realtors® in Downers Grove and has the following real designations: Accredited Commercial Practitioner (ACP), Certified International Property Specialist (CIPS), Short Sale & Foreclosure Resource (SFR), Senior Real Estate Specialist (SRES) and certification in Certified Staging Consultant (CSC). Realty Executives Elite is a full-service real estate firm located at 15400 W. 127th St., Lemont, Illinois that services clients across the Chicagoland area and helps clients buy, sell and lease property.